Scott Pilgrim looks set to take on the world on Blu-ray Disc in time for Christmas. Universal has announced that the Blu-ray release of the critically acclaimed comic-book adaptation is scheduled for November in the US, with Europe following soon after. 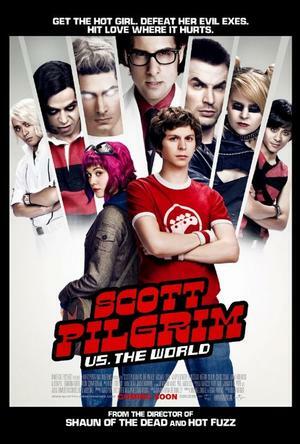 Scott Pilgrim Vs. The World, starring Michael Cera and directed by Edgar Wright, tells the story of an unlikely hero who meets the girl of his dreams but, in order to win her heart, must first do battle with her seven evil ex-boyfriends. In addition to the DVD special features (commentary, bloopers and photo galleries), the Blu-ray edition has a huge collection of exclusive content, including two behind-the-scenes documentaries, features on the film’s music, and in-depth looks at alternative edits to the film and its extensive pre-production process. For the full story and list of Blu-ray content, visit Den of Geek. 3D movie fans will be excited to know that electronics manufacturer Sharp is due to launch two new Blu-ray Disc players with both 2D and 3D capability. The BD-HP80U and the BD-HP90U both feature full high-definition 1080p playback as well as the usual features you would expect from a Blu-ray Disc player. The two slick, ultra-thin devices will also include internet connectivity for interactive content, which means they can play back online content from sites such as YouTube and NetFlix. Sharp is yet to announce UK pricing but the players are expected to launch in the US for £275 – £320. Expertreviews.co.uk has the full story. [tweetmeme source= “blurayreporter” only_single=false]The 3D Blu-ray Disc revolution continues with leading electronics manufacturers exhibiting a range of Blu-ray players and other 3D home entertainment devices at CEDIA Expo in Atlanta. Organised by the Customer Electronic Design and Installation Association, CEDIA Expo showcases products and services for electronic systems in the home and features exhibitions from some of the world’s leading consumer electronics giants. Amongst the latest Blu-ray players launched were three new 3D Blu-ray players from Pioneer which will be hitting the market later this year. No to be outdone, Samsung showed off its HT-C9950W home theatre system with 3D Blu-ray Disc player. Meanwhile Sharp Electronics not only unveiled its new range of Blu-ray players but also a 3D Blu-ray bundle partnership with Universal Studios which will see a Blu-ray 3D copy of Despicable Me bundled with every purchase of a Sharp DVD player. Home Media Magazine has more details here. [tweetmeme source= “blurayreporter” only_single=false]This week we are giving away the extended cut of modern comedy classic Anchorman, brand-new to Blu-ray. 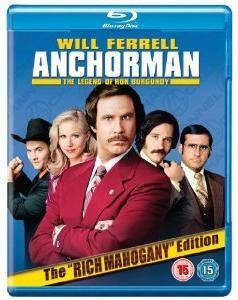 The extended cut of Anchorman, or to give it its official title, the ‘Rich Mahogany’ Edition, sees 70s TV news anchor and local hero Ron Burgundy (Will Ferrell) struggling to adapt to changing times as the first female reporter (Christina Applegate) joins the news team, with a collection of extended or deleted scenes added. The film brought together one of the most successful casts in modern comedy, helping names such as Steve Carrell and Paul Rudd cement their A-list status. Anchorman is well known for its hilarious script and on-set ad libbing, becoming one of the most quoted films of recent years. We want to know who your favourite comedy character or actor is, and which of their famous lines made you laugh the most. To make it easier for us to contact you, leave your Twitter details with your comment. Look forward to your ideas – have fun with this one! For all you Gleeks out there, this will be music to your ears! 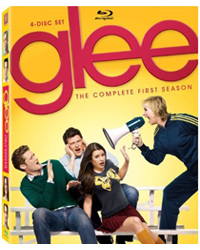 The complete first series of Fox’s smash hit TV show Glee has had the Blu-ray Disc treatment and is now available to all. Including all 22 episodes presented over four discs and with a 5.1 DTS-HD Master Audio soundtrack, the Blu-ray box set will remind Gleeks just why they fell in love with the show in the first place. As you might expect, it comes jam packed with over two hours of Blu-ray extras including a visual commentary with the cast and crew, sing-along karaoke, Glee Makeovers, never-before-seen featurette ‘Sue’s Corners’ and dance tutorial ‘Staying in Step with Glee’. It also comes with a behind-the-scenes look at the infamous “Power of Madonna” episode as well as the crew’s video diaries. Bigpicturesound.com has the full story here. At IFA this year, 3D was a stand out theme, as the world’s largest home entertainment manufacturers showcased a variety of 3D products, from TVs and projectors to laptops and Blu-ray Disc players. A 3D Blu-ray player already on the market is Sony’s BDP-S470, which represents great value at just £180. CNet UK has recently reviewed this model, awarding it an impressive 4.5/5. As for its internet connectivity, it is deemed, ‘just right’, providing UK users with access to BBC iPlayer, Demand Five and Love Film through the Bravia Internet Video service. To read CNet UK’s full review of the Sony BDP-S470, click here. Christmas is coming early this year for Twilight fans with the Blu-ray Disc release of The Twilight Saga: Eclipse on December 4th. Combining teenage angst, sexual tension and plenty of vampire vs. werewolf action, Eclipse stormed the box office worldwide, generating over $680 million. Fuelled by an avid fan following across the world, it is safe to say that its impending release on Blu-ray is hotly anticipated, especially with the exclusive features it has to offer. Fans can enjoy audio commentary by none other than Robert Pattinson, as well as his on screen girlfriend Kristen Stewart. Also included is a six-part making-of documentary, a photo gallery and music videos from the film’s soundtrack. Exclusive to Blu-ray is a selection of ‘Jump to’ featurettes that focus on specific characters, families and action sequences in the film. For more information, MTV.com has the details.